← If at first you don’t succeed…..
Somewhere along the way, the peaceful, quiet days of Christmas past were lost. Somewhere along the way, Jolly Ol’ St Nick, stole the limelight from baby Jesus, and the madness of Black Friday and Cyber Monday, replaced the leisurely gift shopping of days gone by. Instead, it seems, we celebrate materialism, indulgence and the idea that we need more, more, more. As a kid growing up, I recall knowing who Santa was, I think he even signed a couple of our packages under the tree a time or two, but I can’t EVER recall a time, that I didn’t know it was really my parents. I have great memories of Christmas growing up, but you’d be surprised at the ones that stand out most. I remember the year dad went back to college, and we couldn’t afford a Christmas tree, so we decorated our artificial fica tree instead. Tiny red apples, red velvet bows and empty mini raisin boxes hung from its branches, and to my little girl eyes, it was beautiful!!!!! There were very few presents under the tree that year, but I don’t remember thinking much of it. Mom kept us busy with special baking and craft projects, and dad kept us in hysterics on Christmas morning, sticking his new electic drill up his nose, stating it could also double as a nose hair trimmer. As we got older and became teenagers, our finances changed, and my parents got more and more creative in their gift giving…..
One year we went on a family vacation to the Bahamas instead of getting gifts. Another time, Hawaii. One year, we got cash to spend after Christmas at the big sales, teaching us the value of the dollar, and that it could be stretched much further, by waiting for a sale day to shop. Another year, after my dad sold his trucking business, and things were incredibly tight, we did intangible gifts. We wrote letters of appreciation to each member of the family, and that Christmas morning was not spent under a pile of wrapping paper and boxes, but quietly seated around the fireplace, reading those letters of love & affirmation to each other. But, the Christmas that stands out the most in my mind, was not the tropical vacations, not the new boombox or new car…No, it was the year we adopted a family in need, through a local church. We were given an address to deliver our goodies to them, in person. We all loaded up, driving further and further into the oldest part of town, until we arrived in front of a very humble home. Arms loaded with boxes of goodies, we walked to the front door. Once we were done with our “good deed” for the day, we could go back home and have our own Christmas. We knocked on the door, and were welcomed in broken English. Stepping inside, the first thing I noticed was the home was sparse in furniture. Mattresses serving as beds lay on the floor, and open cupboard doors revealed they were indeed, bare. My heart softened. My “good deed” for the day, suddenly turned into so much more. Oh, the joy on their faces as we unloaded box after box of groceries, clothing, toys and necessities. I recall tears streaming down the mothers face, as she thanked us over and over in broken English. The father reached out his work weary hands, silently grasping ours, tears in his eyes telling us how humbled and thankful he was for this, though no words were spoken. Their children ran circles around the old sofa, the language barrier not stopping our interpretation of their squeals of excitement and joy! I didn’t know a day without food. I didn’t go to school without a coat ,because we didn’t have the money for one. I never walked to a cupboard to find it bare. We had so much, and they had so little. Why did I even need the few gifts waiting for me, under the tree at home? It was then I knew what God was showing me…….THIS is what Christmas is about. Giving to others in need, showing them the love of Christ, not receiving! Why, when I had such an abundance, did I need anything? I became more convinced than ever that Christmas was going to be forever different at our house! Fast forward 15 years, I now have 4 little ones of my own, and the huge responsibility of establishing my families traditions…. 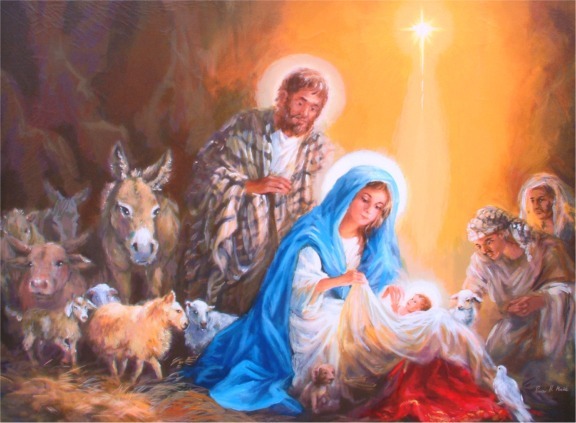 From the very beginning Christmas morning has been Jesus’ birthday, nothing else. We feel Santa “waters down” what we are trying to do with Christmas. Our goal is to keep it about Christ, and His birth, and in striving towards this goal, of keeping Christ in Christmas, we chose to exclude Santa from any of our celebrations. Don’t get me wrong, the kids know who Santa is, and that he is part of the general season of year. 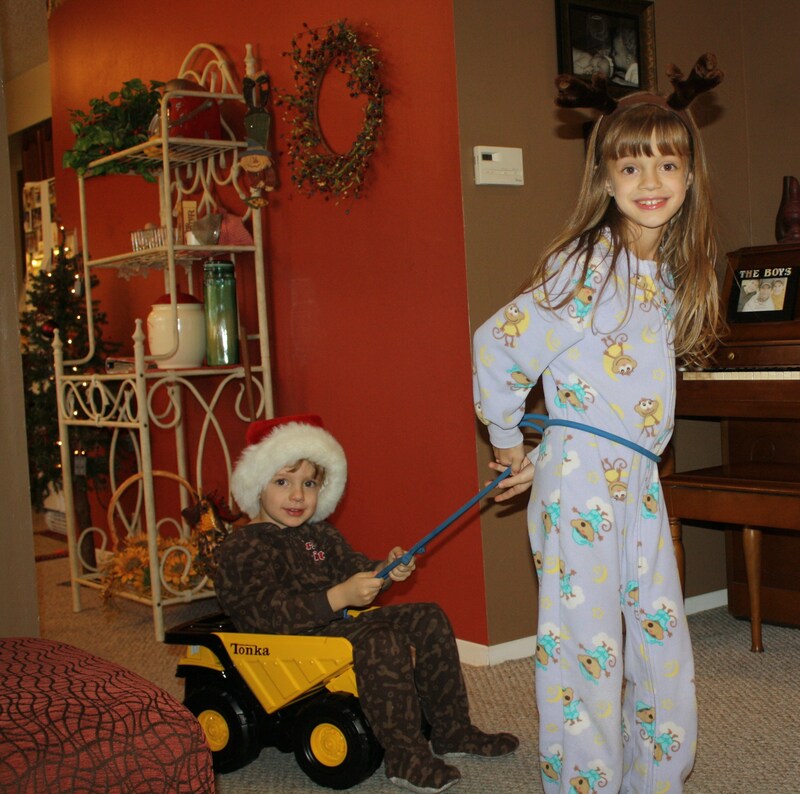 In fact, the older two, were playing reindeer and Santa the other night! That doesn’t bother me a bit. Neither does letting them watch the evening Christmas specials on tv, about Rudolph or Frosty. What a special treat! But there is one rule and requirement of evening TV watching……Commercials MUST be muted. I can’t stand how they try to gr ab my kids attention and stir up the “greedy gimmies” with the ads for the “coolest toy ever“! But, when it actually comes to Christmas day, does Santa have a part? Nope, not around here. We want Christmas Day to be sacred. It’s special. It’s a quiet, calm. A peaceful celebration of the birth of Jesus. It’s not wrapping paper piled knee-high on the floor. It’s not toy fire engine sirens, crying baby dolls and whirring helicopters, drowning out all other sounds of worship of our Lord and King…..the whole reason we celebrate in the first place. 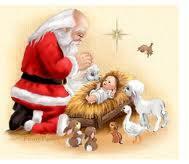 On Christmas morning, you won’t hear shouts of “Santa came!” Instead, shouts of, “It’s Jesus birthday!” are heard. Followed by arguments about who gets to blow out Jesus’ birthday candle after we sing Happy Birthday to Him. After reading the Christmas story, we give each child 3 gifts, representing the 3 gifts given to baby Jesus by the wise men. Buying only 3 gifts for each child, keeps Dale and I in check, as we are doing our Christmas shopping, and allows the focus to remain on Christ, not the need for more, more, more. We celebrate Christmas based on God GIVING us His one and only son, who later GIVES His life as a living sacrifice for us! We want giving and not receiving to be the focus of Christmas. This is why we choose to adopt a family in need, or participate in filling individual boxes, when our church adopts a local school. What fun it is to stroll through the store, with each of my children clutching a paper in their sticky little hands, with a name…….a name of a special boy or girl, about their age, who we can be a blessing to. I love to see their faces as they figure out that no, these new toys aren’t for them to keep, they have enough toys at home. These gifts are for a little boy or girl, who might otherwise have nothing new at Christmas! Granted, sometimes its hard to pack that giant bouncy ball, or sparkly nail polish in the box, for the other child! But, it doesn’t take long for them to grasp, at their level of understanding, the kindness and love they are showing to another child. To understand that Christmas is about giving to others, not asking, begging and pleading for the latest and greatest new toys. It is my hearts desire for our Christmases to be SO focused on Jesus Christ, from my children’s first memory of Christmas on, that they don’t know it ANY other way! Tonya, I’ve said it before, and I’m saying it again: you’re a girl after my own heart. The oldest of 7, Christmas wasn’t much more than another day. A pitiful tree and very few gifts under the tree. No real story elaborated, but it was clear Santa was just some guy in a suit. Year round, we did without SO much. BUT, we too never had empty cupboards, or went without a meal. As I grew older, I always wondered why we were forced to go to church, but none of it was ever ‘reinforced’ or elaborated at home, why there was very little communication period, really. And I wondered why we had the bare necessities (nearly all worn out hand-me-downs, at that), but there WAS money available to do cheap, but nicer or newer, without being SO cheap. As we got older, moved out, things with the younger kids became about the coolest toys, clothes, gadgets, so much different than it was for us older kids. It has been my vision from day 1 (well, before kids, really) to strive to be a better person daily, and at Christmas as well. We do random projects year round (a lot involves school, probably b/c I spend so much time there on my days off), and Christmas is a HUGE time of giving for us. Our kids also don’t go without a few new things at Christmas, but keeping in mind the REAL reason we celebrate this season. And we shop together, wrap and deliver all kinds of gifts during this time of year. What joy to be so blessed to be able to do so! And the joy I get from my kid’s smiling faces and excitement in it all! Call me a mean mom, but often times ‘punishment’ in our house for whining/complaining/fighting results in time-out to sit and write about all kinds of random things that we are so thankful for. It’s a daily happening in our house to talk about things we’re thankful for (and not just while praying for our meals), to never lose sight of the reality of all the many blessings we have, even in the midst of times that might be a little harder than others. I’d like to hope that these daily happenings, communications as a family will be carried forward in my kids as they grow older, and that they know without a shadow of a doubt they were always loved and taken care of, and sacrifices were made in our home so others could experience a little better life, whether it’s words or actions we portray. So, again…….what a great post. Thanks for being such a hard-working, unselfish woman, the world needs so many of us! Loved your post we talked about this a lot the other night and our views on this are so much alike. I have wondered for years how to make the Gold, Frankincense, and Myrrh, have more meaning for what they are and your post helped me think about it and how as they grow older we can do this!! On Christmas Afternoon we bake a Birthday Cake for Baby Jesus and that night we light candels and sing Happy Birthday to Jesus, that is one of my kids favorite parts of the day!!! Our only difference is we do let “Santa” have a small part a very small part. They do recieve one small gift from Santa mostly because it is fun to see them experiance this magical part of the way kids brains work, and they only work that way for a few short years, but Santa is NOT a focus on our season or our “Christmas” day. Jesus is the reason for the season and the reason for our lives here on earth and Christmas is a time to celebrate what God and Jesus sacrificed for us to have everlasting life in a Heaven with our Lord and Savior!! I rarely ever even do Black Friday or Cyber Monday because it just seems so commercial for one and for 2 we are usually traveling and not at a point when we could shop the sales even if we wanted to, plus I think shopping for the kids few things at other times makes my mind stay more on what we are doing and how we are choosing to keep the Season alive for our kids. Shopping for the boxes we pick up every year at church and hopefully later in life more that small boxes but a whole family really in need is a big focus on our lives and a big focus on what the entire season is all about. We had so much fun last weekend going as a whole family to shop for our 3 children whose boxes we picked to help them have a better Christmas then they might have without our help which we are blessed to be able to offer to them. Giving to others and helping to see needs of others and help fulfill them as best we can that is what I want my kids to take away from growing up not focusing on our wants and needs and getting lots and lots of things we “NEED” or want!!! I love your post but I knew I would after talking to you the other day. I love your idea of assigning meaning to gifts using the wise mens’ gifts. 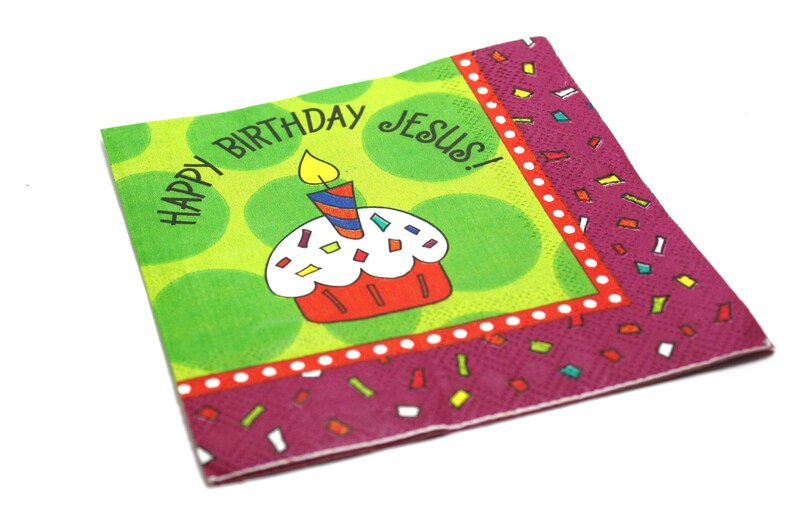 Are those Happy Birthday Jesus napkins ones that you actually found? I make a birthday cake for Jesus every year and those napkins would be awesome! Yes, found them at Hobby Lobby! I was so excited!